It seems like some notifications are disappearing for me after the fact (example below). Was there a change that removes notifications if the same person replies again later, or something like that? Oh, this is expected behaviour, I just never noticed it before. If you’re watching a topic, we don’t want you to end up with millions of notifications about a single topic, so we only keep the ‘most recent’ notification. So after you received the android notification, merefield replied and caused the other notification to be deleted. We don’t delete the notification from Android, only from the web UI. Wow, I’m surprised I only just noticed this. I think collapsing it into a “# replies” notification where you’d still be able to get to all the individual notifications would be good. Or maybe a combo notification where the main link takes you to the earliest unread reply from the group, but I small icon takes you to the whole notification group. 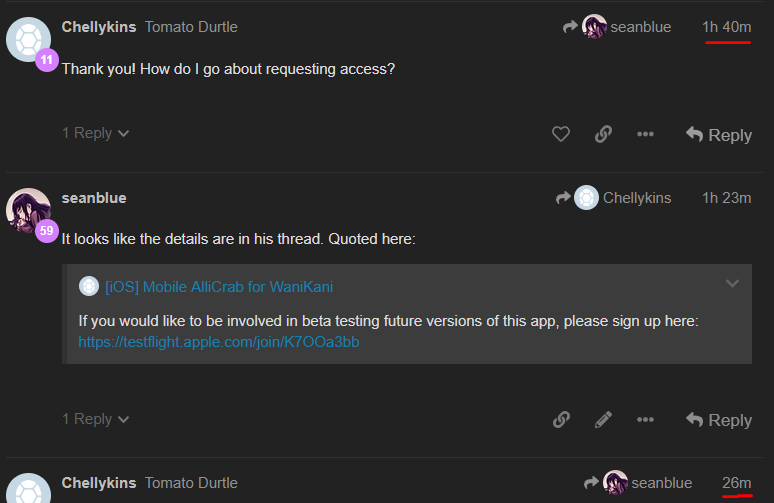 That would also solve the problem where you get replies in the same topic from multiple people, and it’s sometimes hard to find the later replies to you in the jumble of replies. We have all sorts of general requests for highlighting bookmarks, showing replies, unread posts, gaps in conversation and so on a smarter timeline widget. Not slotted for a particular date, but something we think about. Other times, we simply delete all the old notifications for the topic, and only keep the most recent one (as described above). I’m not sure what the exact conditions are for the two conflicting behaviours. I guess where I am coming from is that if I open a topic with 500 posts that I participated in, there is no trivial way for me to see all the replies to my stuff or tell visually where they are. What parts of this big timeline matters to me? I can filter the stream down to “my posts” but still need to do a reply expansion for every post of mine which can take a while if I post a lot. Any solution I can think of for this problem is not easy at all. Your description of the problem lines up with my experience. Finding multiple replies in a large topic is incredibly tedious and time consuming. Personally, I like your proposal as well. I think seeing all notifications individually in the profile (with the possible expansion in the header too) would improve the experience significantly. It’s a shame it’s not an easy thing to implement, but hopefully we can see something like this in the future.